Q: What is the real meaning of the answer '42'? Is it ever revealed in one of the novels? Q: What is up with the towels? Q: Do you have to read the books to enjoy the movie? 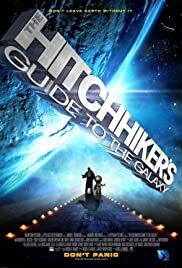 Hitchhiker's Guide is born again! Well, I'm not a film reviewer. I'm not really a fan of film reviewers as their job involves pretending that there is an objective standard that governs how much everyone will enjoy a film (well, some of them are smart enough not to dress their opinion as anything else). Everyone enjoys films in different ways and I like to use my own judgment to decide if a film is worth my time or not (well, that and the opinions of a few trusted individuals who's taste in films is very similar to my own). So this isn't a review, it's just my honest reaction to the film and you may judge for yourselves if my opinion is likely to be similar to your own. I loved it. There were a couple of small points that I wasn't happy with but there was so much that I really enjoyed that I left the cinema very happy indeed. It has a very frantic pace, especially when compared to the glacial pace of the TV series. But, in my opinion, it works. I'll now talk about different aspects of the film. The Cast. Each member of the cast has brought a new interpretation of their character to the film but they are still definitely the same characters. Martin Freeman is very funny but also very human. He's less of a caricature of Britishness than Simon Jones's interpretation. Mos Def is an excellent laid back Ford who occasionally has slightly manic (David Dixon style) moments. 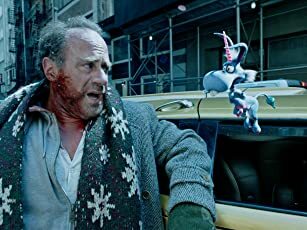 I don't think everyone will like his delivery of some of the lines as he can be very dead-pan at times but I found him very watchable and likable. Sam Rockwell's Zaphod is either lovable or irritating depending on your loony-tolerance. I found his over-the-top performance was just perfect for Zaphod, and frequently had me in stitches. Zooey Deschanel. Mmmm....Zooey. She's the best Trillian ever! She's adorable, funny, charming, intelligent and finally has an emotional depth that was missing from all other incarnations. She works well with both Zaphod and Arthur and their interactions were believable. Bill Nighy gave a performance that managed to be nothing like Richard Vernon's yet at the same time definitely Slartibartfast. Very funny. Very human. Stephen Fry is someone who I new would be good. He has the intelligence needed to get the delivery right and a mysterious gentle voice (like God has popped round for a cup of tea). The Effects, sets and puppets. Wonderful. I loved the Vogon puppets, it made them seem much more real than any CG character (yes, even Gollum). The sets looked great and there is one nice tracking shot down a Vogon corridor that shows just how huge the set was. Every set is packed with detail, I cannot wait for the DVD. The Magrathea 'factory floor' is breathtaking - especially on the big-screen. Zaphod's second head isn't brilliantly executed but it didn't bother me much. The Guide entries. I'm a big Shynola fan. I was extremely excited when I learned that they would be doing the guide entries. I wasn't disappointed - the guide entries look great and are packed with the inventive wit that characterises Shynola's work. The way they visually interpret the words of the guide entries is very clever and matches the wit of the original animations in the TV series but with a more modern approach. The Music. The Dolphin song at the start was wonderful. Call me a softy but a couple of the lines nearly brought a tear to my eye. The music for the guide entries fit really well. The new orchestrated version of Journey of the Sorcerer is great. I was too wrapped up in the experience to really notice the music, I'll have to see it again (or buy the soundtrack)! Editing. The film flies along at an incredible pace but for me it never suffered from the 'why are we here now?' problem that some film (The Phantom Menace) suffer from. I really couldn't tell you how someone new to Hitchhiker's Guide might react. The destruction of the Earth is particularly well handled, managing to be both funny and moving. Stuff I didn't like. Not much really. Part of me craves for the inclusion of things that other parts of me recognise will make the film less effective. One thing that I felt was a shame is that certain added plot elements make the story less bleak. These plot elements actually come from later books in the series so they weren't un-Hitchhiker-y but they contributed to a more optimistic story than I am familiar with from other versions. But this is a minor quibble and it didn't spoil my enjoyment of the film. Though I really liked Zaphod, I didn't really like the second head. It didn't work as well as it might have. Still, it was preferable to a shoulder-mounted permanent extra head - which would have been wrong for many reasons. Conclusion. It is The Hitchhiker's Guide to the Galaxy reborn with a new energy. It is lighter than previous incarnations but still retains most of what I love about the story. It also adds a brilliant level of visual inventiveness that matches the aural inventiveness of the original radio series. People expecting the TV series but with better effects will be disappointed. This is a new beginning. 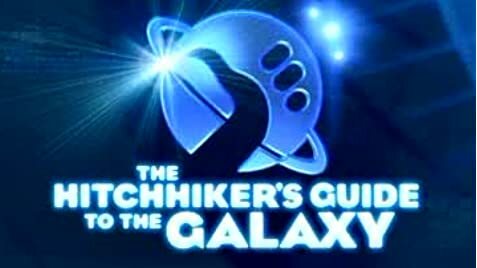 The Hitchhiker's Guide is alive again, it is an enormous shame on a galactic scale that Douglas isn't here to enjoy it. The huge applause after the film showed I wasn't alone in having a good time. Also, the film contains my favourite line. It previously only occurs in the second radio series (as far as I know) and is moved to a different occasion but I was dead chuffed when I heard it! 365 of 584 people found this review helpful. Was this review helpful to you?